Many of our friends is asking How can they Subscribe the Phillip Reits ETF IPO - the full name is actually "Phillip SGX APAC ex-Japan REIT ETF"
Whats the Benefit of this ETF, why not i just buy reits off the market? - Yes, you can buy individual reits off the market, however sometimes if you want to have a diversified portfolio by have more Reits in your portfolio. 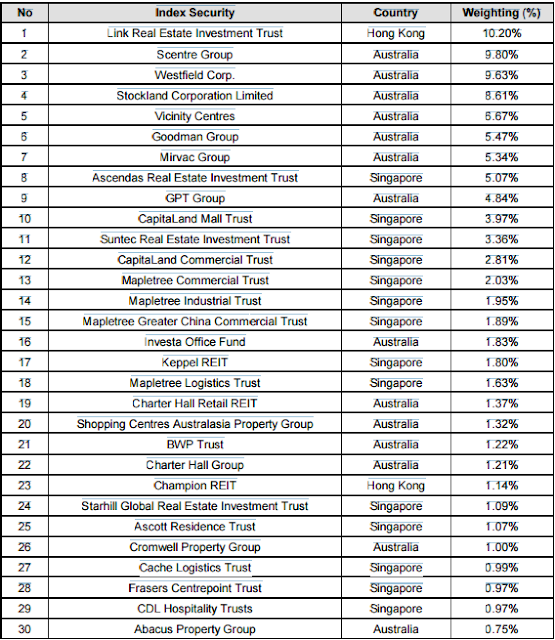 This ETF consist of 30 Reits, which means by buying 1 ETF counter, you are owning 30 different reits. This means lower cost for you, instead of paying commission for purchasing 30 reits, now you just pay 1 time. The ETF will weight and rebalance its investment basket based on the dividend payment of the REITs, ensuring only the top quality and highest dividend paying REITs are invested in, and poor performers weeded out. You can be assured of exposure to a diversified group of top 30 APAC ex-Japan REITs paying sustainable dividends. Being an ETF, the units can be traded in the exchange, which allows a higher level of liquidity compared to traditional unit trusts. The whole constituent list is also easily accessible allowing transparency. How much is the Dividend Yield? 1) Able to use CPF or SRS to subscribe for this IPO? 7) Then how I calculate the amount for the investor to transfer the funds?  Countries eligible for inclusion: Australia, China, Hong Kong, India, Indonesia, Malaysia, New Zealand, Philippines, Singapore , South Korea, Taiwan and Thailand. Phillip SGX APAC ex-Japan REIT ETF has lodged its IPO preliminary prospectus with the Monetary Authority of Singapore (“MAS”) in conjunction with its plans to list its Units on SGX-ST Mainboard. Kindly be informed that we are offering the USD tranche only during this IPO offering period. Where to see the Prospectus? During the initial offer period (05 October to 13 October 2016), you can place your orders by contacting your trading representatives. Feel free to Email us for more question!